The outskirts of Baghdad are very dangerous these days. Islamic State fighters hide here, mounting attacks on the city. A security barrier is planned but the real issue is intractable. While Baghdad is still the venue for many suicide bombers and car bombs, it is the capital city’s borders that present one of the greatest security problems for locals – and the problem in the so-called “Baghdad belt” looks to be getting worse. In Yusufiyah, an area on the southern outskirts of the city, Sheikh Othman al-Janabi and his nine-member family have been resisting leaving and have just been dealing with the increasing insecurity here. Karim al-Mashadani lives in Tarimiyah, on the other side of Baghdad but he is dealing with the same kinds of problems as the al-Janabi family. There are literally forests of orchards and gunmen can hide there for months without discovery. Just like Yusufiyah, Tarimiyah is located on the outskirts of Baghdad. Along with Latifiyah, Madaen and Arab Jabour in the south, Abu Ghraib in the west and Mushahada and Taji to the north, these areas make up what’s known as the Baghdad belt. In the past, these more rural areas provided shelter to the extremist organisation, Al Qaeda in Iraq. Now the same areas are being used by the new incarnation of the latter, the Islamic State group. In the distant past Baghdad’s belt was a mainly agricultural area, supplying a lot of produce and dairy products to the capital. Residents of Baghdad used to take trips out to the countryside to escape city life but today locals tend to avoid these areas. As it is, it’s not particularly easy to come here anymore anyway. There are dozens of checkpoints, some just 500 meters apart. Yet somehow the area still isn’t safe. 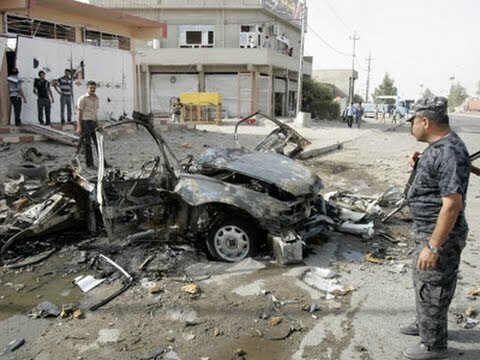 After a series of suicide bombings in these areas, which targeted Shiite Muslim mosques, Qais al-Khazali, the leader of one of Iraq’s more controversial Shiite Muslim militias, noted that it was more important to secure these areas than fighting for the distant northern city of Mosul. “The Islamic State is using the city’s outskirts as camps, housing hundreds of fighters and suicide bombers and to make car bombs,” al-Khazali said during a television interview. Even if this wasn’t a deliberate ploy, the extremists would still be in these areas. Baghdad doesn’t have any absolutely clear boundaries or walls and its geographical border tends to be these rural and agricultural areas. It also means the city is connected to four different provinces through the less populated land. There are plenty of back roads and unmarked farmer’s tracks, that are not policed, connecting the provinces to the Baghdad belt and then on into the capital that are now being used by the Islamic State, or IS, group. Al-Khazraji confirms what al-Mashadani said earlier about the local population being seen as terrorist affiliates. “Militants find a lot of people in the [Sunni Muslim] community who sympathize with them,” the colonel noted. As another member of the Iraqi military confirms, not even the US army was able to control the Baghdad belt, even though they launched several major operations here between 2006 and 2007. They did arrest dozens of extremists and also found troves of documents relating to Sunni Muslim extremist organizations like Al Qaeda, who were active in the area. The fact that there are a lot of Sunni Muslims living in this area is no coincidence either. In the 1970s, Saddam Hussein’s Baath political party – dominated by Sunni Muslims – tried to change the demographics of these areas. They resettled Sunnis in areas where a mix of Sunni Muslims and Shiite Muslims had been living together for years in order to try and encourage Sunni dominance. To try and solve the ongoing security problems in the Baghdad belt, the Iraqi government suggested building a fence around the city’s outskirts which will include a three-meter high concrete blast barrier and a three-meter wide trench. This isn’t a new idea. A similar plan was mooted by the US military in 2006. But at the time Sunni Muslim politicians objected to the idea because the security fence was ostensibly splitting Iraq’s populations in two – this would exacerbate sectarian tensions, they claimed. The politicians were also concerned about the fact that land that was supposedly in Anbar and Babel provinces would become part of Baghdad without the correct procedures. There is opposition to this idea from the same quarters, for the same reasons, again this year. They oppose the idea of lifting the concrete walls that separate Sunni Muslim and Shiite Muslim neighbourhoods in Baghdad and simply transporting them – and the idea they stand for – to the outskirts of the city. Really the biggest problem in the Baghdad belt is the same as the country’s biggest problem: Sectarian antipathy. The Sunni Muslim locals don’t trust the Shiite Muslim security forces and vice versa. More local security forces – that is, those native to the Sunni Muslim neighbourhoods – are not seen as trustworthy as some of them are known to have collaborated with the IS group. Some Shiite Muslim militias in these areas have managed to keep areas secure but they have achieved this mostly by using force. There have also been injustices and violations in the area – which is why the security that is imposed can only ever be temporary. As soon as the security forces with draw – as some of them did last month when the Iraqi government stopped paying their salaries – then the extremist groups reappear.